For some people, the fall season is all about the gridiron. Football players are creatures of habit, constantly engaging in repeated actions during practice to better prepare themselves for gameday. That being said, it is imperative that these athletes also take injury prevention into consideration when constructing a game plan each week. Taking the proper precautions to protect your body from injury is of equal importance to learning what type of offense the opposing team is planning on unleashing. 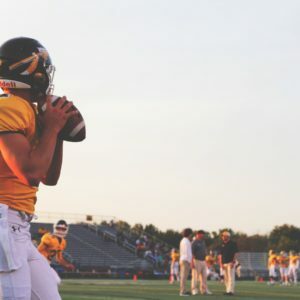 At Massapequa Pain Management, a chiropractor in Massapequa can help these athletes prepare themselves for games and practice sessions in order to prevent them from experiencing these common football injuries. In recent years, studies have discovered that there is a strong connection between football players and head injuries. Concussions have become a polarizing topic in today’s media, with even some professional players abandoning their careers due to long-term risk. Due to the aggressive and physical nature of the game, it’s no surprise that concussions are a common injury. A concussion is a serious trauma to the brain that changes how it works. Frequently, they crop up in football after a helmet to helmet collision. Those who suffer from a concussion will experience temporary symptoms such as a headache, memory problems, difficulty concentrating, and balance/coordination issues. The Achilles tendon is located in the back of the ankle. When the tendon is overused and not properly stretched, it can lead to pain and inflammation. This can create discomfort for players as well as potentially hinder their performance on the field. Ankles of football players undergo a lot of stress. With constant pressure, pivots, and changes of direction, it makes them susceptible to soft tissue damage. Hamstrings run from the bottom of the buttocks to the back of the knee. When a player is not conditioned or warmed up properly, the hamstring can potentially tear from bursts of speed. ACL injuries – When the anterior cruciate ligament in the knee gets damaged or torn due to a player receiving impact from the front or rear. MCL injuries – This injury is when the knee is impacted from the side causing a tear in the medial collateral ligament in the knee. Torn meniscus – When a player rotates their body while the foot stays planted, the knee can twist, causing the meniscus to tear. Football players who have suffered one of these common injuries should consider consulting a chiropractor in Massapequa who can help provide assistance and potential pain relief for the ailment. Make it a point before each game/practice to properly warm up and cool down. Focus on strength training and stretching to increase stability and flexibility. Drink enough water to stay hydrated and prevent muscle cramps. Wear protective equipment such as a helmet and mouthguard and make sure they are properly fitted. Consult with a chiropractor in Massapequa for more prevention strategies. At Massapequa Pain Management, a chiropractor in Massapequa can help an athlete play at their optimal level of physical capability. By specializing in sports therapy and injury prevention, they’re able to provide a personalized plan of attack for football players who need a specific part of the body treated. If an individual is interested in learning more about how they can prevent these common football injuries, contact Massapequa Pain Management for an appointment and consultation.